Sorghum midge (Stenodiplosis sorghicola) is a serious insect pest of grain sorghum in Australia. It can result not only in major damage, but also require several repeat insecticide applications during the season. Costs from residual losses and uncontrolled damage are estimated at being up to $10 million annually. Management of this pest is now centred on growing midge resistant hybrids. 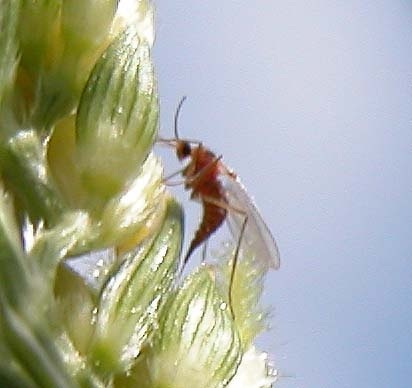 Adult midge emerge in early spring and often spend several generations in Johnson grass (Sorghum halepense) before moving into sorghum crops. Females lay eggs into the flowering spikelets (Figure 1). The larvae then hatch and feed on the developing grain, preventing normal seed development. The midge life cycle is between 2-4 weeks, so with optimal seasonal conditions, extremely high midge numbers can build-up over a growing season (particularly if the flowering period is extended by successive plantings). 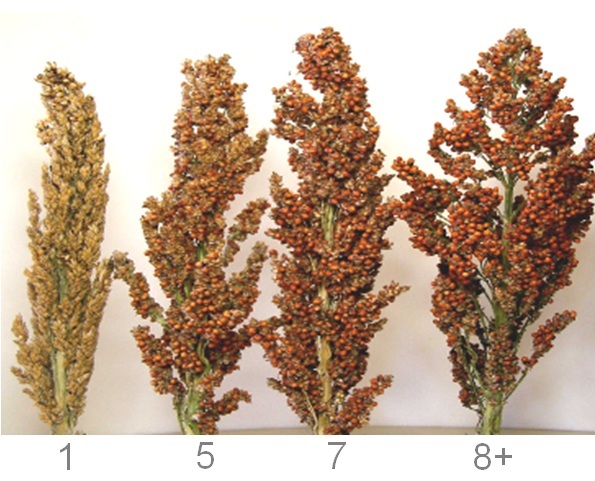 On a susceptible hybrid, offspring of each egg-laying adult can destroy up to 1.4g of grain. Large numbers can lead to devastating damage and in some cases, complete destruction of the crop. Figure 2: Damage levels to diferent MR rated hybrids under equivalent midge pressures. To manage this problem, midge resistant hybrids were introduced over 30 years ago. In 1993, the (now) Queensland Department of Agriculture and Fisheries (DAF) in partnership with GRDC and the commercial sorghum breeding companies, developed a protocol for measuring the midge resistance (MR) levels in grain sorghum hybrids and assigning official MR ratings to all the commercially released lines. The rating number is a measure of: the amount of grain lost per visiting female midge per day. It ranges from 1 (nil resistance) through to 8+ (‘practical field immunity’ under most conditions and maximum commercially available resistance). In practical terms, this means that a 7 rated hybrid, when exposed to the same midge pressures as a 1 rated hybrid, will sustain 7 times less damage (Figure 2). The testing protocol, carried out by DAF, involves planting an annual trial in a semi-controlled environment (ideal for sorghum and midge) and subjecting the plants to high midge pressures. The resulting midge damage per head is then assessed for all entries. For evaluation purposes, the test (pre-commercial) hybrids are grown alongside standard/control lines of known MR ratings. After statistical analysis of the results, official MR ratings are then assigned for each hybrid. This testing regime provides a measure of quality assurance for growers by ensuring hybrids are independently assessed for relative midge resistance in a precise and consistent manner every time. Ratings and the accompanying logo (Figure 3) are only issued to hybrids assessed by the scheme. official MR rating and logo. - Participating seed companies in packaging, advertising and marketing their sorghum hybrids. - DAF and GRDC, on their respective websites. Growers are able to use the MR rating as a guide to selecting suitable hybrids at planting (Table 1), and as a tool for calculating threshold limits for crops, permitting more targeted insecticide applications. These threshold limits not only vary with resistance levels but take into account commodity prices and the cost of insecticides. They are also calculated using the factor of 1.4 gm of grain destroyed per one egg-laying adult. Alternatively, the Beatsheet blog, a DAF run website about insect pest management issues relevant to Australia’s northern grain region, has an online Economic Threshold Calculator to do this more easily. Hyrbid MR Rating Seed Co.